It’s funny how politics and policy debates work. For five years, politicians with a destructive and reactionary agenda have been taking a wrecking ball to the once forward-looking state of North Carolina to relatively little national note. As was detailed at length last December in the special NC Policy Watch report, Altered State: How 5 years of conservative rule have transformed North Carolina, the list of subjects in which once moderate-to-progressive laws and policies have been razed and reversed is as long as your arm. Taxes, health care, civil rights, the social safety net, environmental protection, reproductive freedom, voting rights, consumer protection, LGBT rights; name the topic and North Carolina has moved backward. Now, however, with arrival of HB2, everything has changed. Despite the obvious expectations of the sponsors of the now infamous state discrimination law that their actions would stir up a burst of energy and enthusiasm amongst conservative true believers for designated political candidates, provoke some grumblings from progressives and then fade away, the opposite has occurred. Today, that’s all out the window. In April of 2016, North Carolina is Mississippi as far as most of the rest of the world is concerned. “Officials in Charlotte, N.C., spent more than a year carefully considering and debating an antidiscrimination ordinance that was passed in February to promote the city’s culture of inclusiveness. State lawmakers quashed it on Wednesday by passing an appalling, unconstitutional bill that bars transgender people from using public restrooms that match their gender identity and prohibits cities from passing antidiscrimination ordinances that protect gay and transgender people…. Proponents of so-called bathroom bills, which have been introduced in state legislatures across the country, have peddled them by spuriously portraying transgender women as potential rapists. Since the time of that editorial, the hue and cry across the nation and, indeed, around the world, has continued to grow on an almost daily basis. From a list or more than 180 leading corporations to entertainers like Bruce Springsteen and Pearl Jam to countless nonprofits, professional associations medical societies and state and local governments to professional sports institutions like the NBA and ESPN to, amazingly, NASCAR and Trump himself, the critics and opponents have continued to multiply. Last week, even President Obama was forced to weigh in on the matter. When pressed by a reporter at a joint press conference with British Prime Minister David Cameron for a response to the Foreign Office advisory, the President called for the repeal of HB2 and a similar law in Mississippi, saying they were both “wrong and should be overturned” (even as he tried to make clear that both states were still lovely places to visit with lots of nice and welcoming people). All of this must undoubtedly seem hugely unfair to Governor Pat McCrory, Senate President Pro Tem Phil Berger and their allies on the religious right who championed HB2. 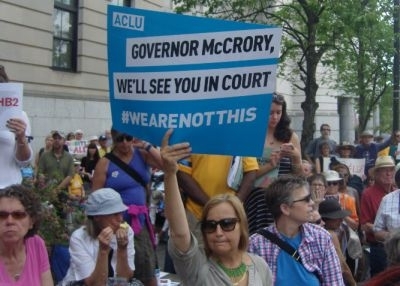 In their eyes, North Carolina is the same old state it always was. When one listens to them, one gets the vibe of people who feel they’ve been hugely wronged by forces beyond their control and understanding. Last Thursday, Berger once again took to a Legislative Building microphone to bellow about “bathroom safety” and the dire threat of men donning disguises in order to enter women’s restrooms even as he pirouetted incomprehensibly and defended the right of private businesses to enact whatever bathroom access policies they choose. Meanwhile, just yesterday, the Governor’s office took the downright bizarre and borderline juvenile step of issuing an official statement to whine that the petitions delivered to the Old State Capitol Building yesterday by opponents of HB2 didn’t actually fill all the boxes that they had used as props at the press conference prior to the delivery. Apparently, the Governor would have preferred it if the advocates had killed a few more trees by putting each signature on a separate piece of paper rather than simply delivering printouts of the tens of thousands of names gathered online. The strange thing about all of this, of course, is that there is a grain of truth to the whining of the HB2 defenders. The state really isn’t that different today than it was five weeks ago. Even progressive advocates can concede that if national and international observers were going to get exercised about the behavior of North Carolina leaders, they could and probably should have acted a long time ago. Unfortunately, for McCrory, Berger, Rustin and their allies, the world of policy and politics is a complex and unpredictable arena. Sometimes, you can’t foresee what will spark a popular and irresistible movement. Discrimination in Alabama was no different in 1956 when Rosa Parks refused to walk to the back of the bus than it was two or three years prior to that. Soviet totalitarianism was vastly more powerful and destructive in the 1970’s than it was when the Berlin Wall fell. South African Apartheid was much more vicious when Nelson Mandela was sent to prison than it was when he was released and, ultimately, swept to power decades later. And so it is today in 2016 North Carolina. It’s true that North Carolina is far being from America’s most reactionary state. In many ways and locales, it remains a state of great promise and progress. Like it or not, however, HB2 has – as far as most people are concerned – altered the common perception of reality. This is true even for North Carolinians who now oppose the law by a significant margin. Simply put, HB2 has, in the modern vernacular, “gone viral” and pushed the issue of LGBT equality to and beyond a new “tipping point.” Opponents of the law have captured the popular imagination and, at this point, it’s extremely difficult to see how they will lose it. And try as they might to resist the tide, the supporters of the law will not be able to push it back or force the genie back into the bottle. It’s true: the General Assembly may convene and adjourn the 2016 session without taking any action to repeal the law, but like Bull Connor, Mikhail Gorbachev, and F.W. de Klerk before them, they are no longer the masters of their own fate on this matter. North Carolina’s “brand” has been grievously harmed by the new law and, at some point in the near future, the people of the state will demand and force a repeal so that repairs can commence. What’s more, politicians will resist the demand at their own peril. Why did the religious right support a bill to enable discrimination against Christians? Next article Where does McCrory really stand on discrimination?